If you need a low-cost counting solution, nothing beats the QTech model ECS. This inexpensive scale provides quick and easy counts without compromising accuracy. Battery operated, the portable ECS can be quickly and easily moved to the counting task at hand. It is economical enough that multiple units may be deployed wherever the need exists. Even though it is small in size, the ECS can handle weights up to 20 pounds! The optional extended platter permits the weighing and counting of oversized objects, making this compact scale even more versatile. 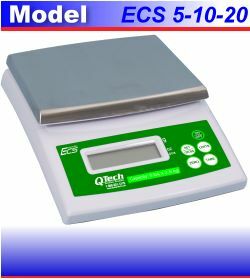 Weight, count, kit, batch,...the ECS can do it all at fraction of the cost of other digital scales. Compact Size and Lightweight for easy transport and use. Displays Piece Count and Weight - pounds, ounces, or kilograms. Tare Feature lets you count items in a box, tray, or bucket. Three different weight capacities to match your particular counting need. AC or Battery Operation for complete mobility. Perfect for labels, envelopes, business cards, booklets, etc. Optional Laminated Platter enlarges the working surface to 9 1/4 x 11 1/4"
Can count folded, bound, and die cut pieces as well. Ideal for counting assembly components as well as finished goods. Perfect for small size parts of any type: metal, plastic, fiber, including springs, screws, hardware, beads, electronics, etc. Counts coins, tokens, tickets, or pull tabs. Compact design and battery operation is perfect for route collections. The ECS models are able to mix more than 95% of all popular ink formulas in amounts of a 1/4 lb. or more. The use of "Base Inks" allows for the mixing of any amount of ink. Ask us for details. or electronically reproduced in in any form. Partial and other distribution means require the permission of QTechScales.com. All rights reserved.